If you're a beginning knitter, the idea of knitting something in the round may be intimidating. 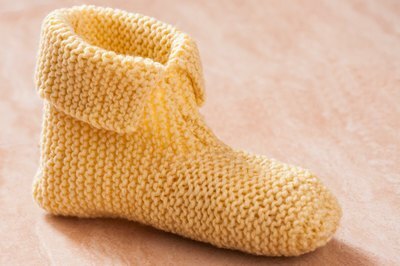 You don't have to master the art of double-pointed needles in order to make knit slippers for beginners. You can knit slippers for beginners on two straight needles and seam them together when you finish. 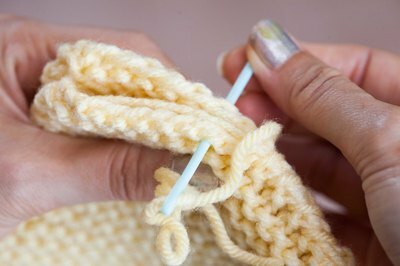 A basic pattern can work for any yarn style or foot size, if you simply add or subtract stitches from your initial cast-on. Cast on enough stitches to make a width of approximately 15 inches for a child's slipper; for an adult, cast on enough to make 16 to 18 inches. 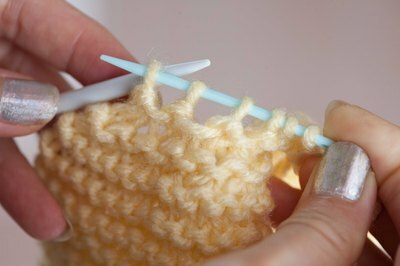 Knit every row until the piece measures 4 inches high (5 to 5 1/2 inches for adults). 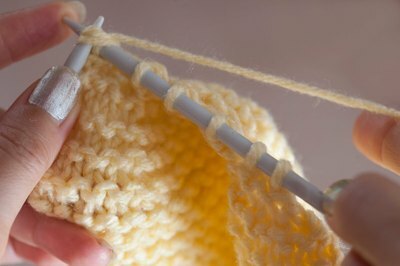 Cast off the first 2, 3 or 4 inches' worth of stitches (for child, adult small and adult large) at the beginning of the next row and then knit across the row. Cast off the same number of stitches at the beginning of the subsequent row and then knit across. On the third decrease row, cast of half as many stitches at the beginning of the row and knit across; repeat this on the fourth decrease row. 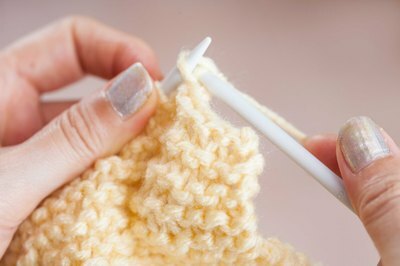 Knit every row for 2, 3 or 4 more inches. On the next row, knit two stitches together all the way across the row. Knit the next row evenly. Knit two stitches together across the following row. Cut your working yarn, leaving an 18-inch tail. Thread this tail onto a large-eye blunt needle and slide it through each stitch loop left on the needle, removing them from the knitting needle as you go. Pull tightly to cinch the toe portion of the slipper closed. Stitch back and forth in a shoelace or looping pattern up the toe and top of the slipper to close the side seams together on top of the slipper. Continue stitching until the seam is long enough to cover the top of the wearer's foot. Knot the yarn and weave in the ends. Close the seam that will go from the back of the heel to the back of the ankle. 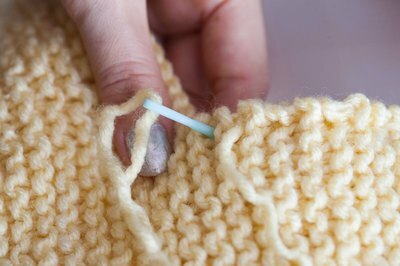 To do this, thread another length of yarn on a large-eye blunt needle and use it to stitch this seam together as previously. Fold down the front edges of the ankle portion of the slipper into points like a collar.